Xander was struggling in her math book this year. She had been using Spectrum and Evan Moor. This year, we switched to Bob Jones University Press. I saw that the “appropriate” grade level 5 was going to be challenging, but I offered her the choice of 4th and 5th. She chose the challenge. We started out with some intense place value…including high value (billions, etc.) and DECIMALS!!!!! Fortunately, I found some math help aids online at http://www.math-aids.com/ . I added about 5 pages to the two in her book on place value. She still struggled with certain aspects of the concept, which was evident in her final test, but after a few weeks of pounding the same topic, she needed to move on. AND…we moved on right into the hands of addition with random place values! So, she needs to be able to recognize place value to organize the numbers by their place value in order to add them together. She was fine when the problems were all lined up for her, but when they were lined up horizontally, she had a complete meltdown. ...technically the meltdown was caused by the fact that she had completed 10 problems on her own. They were hard problems, and they were all wrong. She doesn’t tolerate her own mistakes well. (Hmmm…wonder where she gets that?) And she REALLY can’t tolerate having to slow down, backtrack and make corrections. So, she had to spend a good deal of time in her room, during which I encouraged her to pray that God would change her heart and her attitude. When she had calmed down, I let her come out and eat lunch. Then, she was ready to get back to it. In the meantime, as homeschool mom, I was trying to cope with the frustration of being on hold. She needed my help with direct instruction. I wanted to get my part of the work done, so I could move on to other things. BUT…we obviously couldn’t move on until she had an attitude change. I had to adapt my plans and adjust my mindset, so that I could demonstrate a good attitude. As I focused on God, I had the inspiration to help her by making a place value chart for each of the problems. With this math aid, she was able to pay attention to the place values and complete the page – not without error, but more successfully. It was my hope to move on to the next page. However, I had to be sensitive to her ability to learn and retain the information. The second page will allow her more practice, and I decided it would be best to let her brain process what we did and then expose her to the application of that knowledge tomorrow. 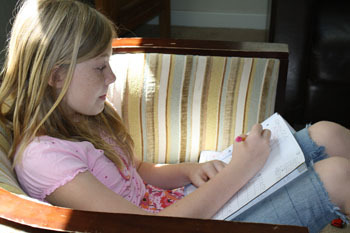 This is the benefit of flexibility and individual instruction in homeschooling!